The 2019 Suzuki Jimny is without doubt the best small 4x4 you can buy - assuming you're a farmer. If you're not, and you're looking for a left field little runabout, the compromises may be too great. You requested views, so...your overall summary, deals with the Jimny, being shortlisted as a small crossover, in the same class as eg Captur, Juke, Ecosport...but they are not in the same sector as this car. Jimny appeals to those who already have/had one/several, eg those living in rural areas, those with unmade roads with winter conditions to consider, both these as PRIMARY buying considerations, not as with the above cars, which would by and large not be as suitable as Jimny. Those folks who buy for the ladder frame chassis and other aligned attributes, know what they will be getting and are not looking for the qualities that Captur, Juke would give them, above the primary reasons aforementioned. Price is being suggested beginning at £16K!. I read that a few weeks ago, there were 250c left in the UK. Those who want/need the Jimny for the above reasons and more, will be hot footing it down to their (not so) local dealership and begging for one of the previous...if there are any left. There will be a healthy sellers market for any late plate/low mileage previous gen cars and perhaps for any decent condition 90's car also. 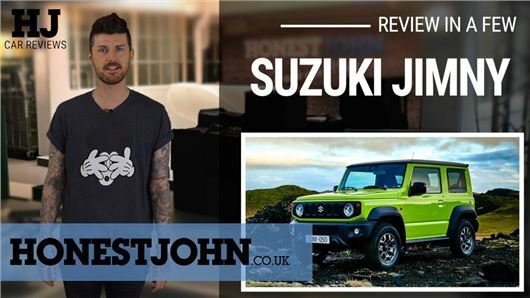 Test Jimny for what it does offer to those few who want/need it and it will, pricing apart, show a very different slant on this very decent car. Please will you comment on this piece. Poor man's Jeep with a tin roof. Well, you've got the readers typing like crazy on this one...how about getting hold of the MY2019 Subaru BRZ/Toyota GT86 and watch the divided opinion posts roll in, re "where is the turbo/supercharger...seven years and their still not listening to us" debate...oh dear, they really should be looked up the R&D brief, before clacking away at the keyboard on this one. A classic example being the venerable Landrover Defender ! Not the best car in so many ways , BUT, SO good in the environment for which it was designed . Where i live on the outskirts of Snowdonia, both Defenders and Jimnys share equal credibility with the people who buy them . To paraphrase another major motor companies advertising blurb 'if you want to go to remote exotic places buy a juke/qashai , IF you want to get back too, get a defender/jimny! The bottom line here is, when you get stuck in a snow bank or a muddy field, it'll probably be a Jimny or a Defender that will tow you out ! I would really like one of these bad boys for around town-but I am to wedded to my nice comfortable Suzuki Swift !!! I have one at the moment and it's frustrating but utterly lovable despite it's shortcomings, just like you said Mark. I'm sorry of this seems like a nit-pick, but the Honest John website is held up as an expert, authoritative source of information for all motorists. So I really think you would set a better example in your video if you ensured that both hands were on the wheel at all times (except when changing gear, etc.). Check it out for yourself, and count how many times your energetic gestures mean that one or both hands are waving around rather than steering the car! If you were attempting humour at feigning ignorance about the chassis and gearbox it didn't work for me, sorry. If you genuinely didn't know....well, that's pretty damning of a road tester who had actually used the car off road and supposedly didn't bother to understand the vehicle's usp. Humour, sir. Thanks for pitching in though, and sorry you didn't find it funny. Can I interest you in a knock knock joke...? I'm sorry. I've reread my message and it comes over harsh. I do get you like to inject humour into your videos. It just seems to many in the media seem to wear their ignorance as a badge of honor these days. We've had a few 'proper' off-roaders as well as cross overs (semi rural home, unmade roads hilly terrain) and I think you're right on the money with this review. The Jimny is just a laugh and very easy (if small) to live with and quite a handsome machine in its new clothes. In this day of modern engineering is it necessary to have ladder frame chassis, this will not be required by any owner to go where no man has been before. And back. Penner, do you, by any chance, read the Daily Express? Sorry for my delayed reply, Matthew, which is hell no. I can use words of more than two syllables, do joined-up writing and everything. This review is spot on and brings me back down to Earth and in touch with common sense. I hated the concept of the SUV until I drove one as a courtesy car. The higher driving position / visibility and the fact that it seemed more enjoyable to drive at slower speeds (thus safer). So I decided to make my next car an SUV when I started reading about the new Jimny and automatically started trying to justify its shortcomings in order to convince myself to buy one (as mentioned in the review). But at the end of the day I don't need to venture off road much so I need my next car to drive well on road, and have a practical interior / boot. I also want something with a good crash rating (not criticised for structural integrity as well as safety aids). Unfortunately that isn't the Jimny, regardless of how greedy Suzuki get with the pricing (like they did with the Swift Sport). sounds like it's great fun offroad, but surely it's not beyond their engineering ability to make it better on the road when not doing that? - the two dont have to be mutually exclusive. having said that yes i'd still fancy one as it's little and japanese and hopefully bulletproof. Not beyond them at all... but, the costs involved trying to bridge the gap to include engineering in, on road capabilities, would ensure its (even more so) priced out of reach. Given the target market and satisfying that, which it most certainly does, in this case, these ideals are mutually exclusive..you need to look at one of the usual suspects for your next car, if you cannot abide the lack of on road sophistication. I agree entirely with Mark - this is not a small crossover but a genuine mini off-roader like a Defender or a G-Wagen. Everyone seems to have forgotten that Suzuki already makes a crossover/mini-SUV - the Ignis. This is a proper crossover/SUV with funky looks, high driving position and even a 4x4 with a semi-hybrid engine. The Allgrip is substantially cheaper than the Panda 4x4 and much more modern, with a great interior, excellent infotainment system and good build quality. We bought one as my wife has to be off road once a week during the winter with her dogs and the ride height is the same as the Vitara except for the front spoiler, which will definitely have to go! We looked at the old Jimny andit really was too basic but the new one looks good and is a great price for a proper off road vehicle, but it is NOT an SUV. So Mark, go and look at the Ignis Allgrip SHEV for a high riding mini crossover with character, excellent boot space, flexible seating, economical and a 5 star crash rating. The previous Jimny was, in my opinion, a brilliant, quirky vehicle. Remember the ridiculous snow storms we had in 2009/2010? A friend of mine lived in the remote Scottish Borders and not even his next door-neighbours Land Rover Defender could make it out. My pal's light little Jimny allowed him to cross a field onto a B Road, and join the road into Edinburgh. Despite living 30 miles away, he made it into work sooner than some of the city dwellers. Reading these comments about practical virtues overriding comfort/safety kit reminds me of an early Lada Niva poster, which said something like "when S...H...T..F..you'll be glad you bought one of these". I absolutely LOVE this little car. I don't know the reason why they don't make a 5 door version of this brilliant little car, but there must be a valid reason. I recently purchased a new car and I would have bought one of these in an instant... well I may have done, not sure about the 4-speed auto box though. But, as I don't drive motorways I probably still would have bought it. After all, my Suzuki Wagon R+ was a 4-speed auto and that was brilliant and I had it for 15 years! But when the auto gearbox went, I decided to change. If ONLY the new model had 5 doors I would definitely buy one. Until then, well I will keep looking and wishing! Wish the guy testing it knew a little more about the vehicle. A friend who lives in the city, never goes more than 10 miles out of it and only uses it for shopping bought a new Jimny in 2008 and she loves it. One morning in the snow she took it out and another neighbour was stuck trying to get back to his driveway and was shovelling to get some traction when the friend came along, straight up the hill into her driveway in her Jimny, did he look and the friend was in her mid seventies then. I noticed that it actually comes with a spare wheel was not mentioned in the test. When I retired in 2012 I bought a new Jimny in Durban, South Africa (same spec as UK except no rear fog-light and odometer calibrated in kms) I covered 30,000 kms (18,600 miles) in two years with my wife all over South Africa, Namibia, Botswana Mozambique and Angola. The Jimny never put a foot wrong and on a number of occasions I rescued Landcruiser / Range Rover drivers axle deep in sand in game parks and on beaches. Often, we covered distances of over 800 kms per day without ever seeing any tarmac. I then shipped the J to the UK had it "converted" to UK spec (aforementioned fog-light and speedo now calibrated first in MPH and second kph) and am still driving all over the UK routinely. Often overlooked is the fact that it is a very comfortable off-roader and in spite of long hours behind the wheel we never suffered any form of lower back ache, so common in "softer" vehicles. In addition I enjoy the fact that it is a 3 door so I am not obliged to regularly take other people around. This sounds somewhat selfish but I tend to leave the rear seats folded flay with boots, hats, coats, even bbq stuff, ground-sheets, foldable chairs and more carefully stored, in case the British weather allows us to use any, or all of these items from time to time. The J is infinitely reliable (one parking bulb only in 6 years) and only recently (Sep '18) have I had to change tyres as I have now completed 70,000 kms (43,400 mile.) If I have a minor complaint it is fuel consumption but I am clearly not in the boy-racer category so I achieve relatively good consumption figures overall. Unlike few other makes and models I am always amazed, and delighted, when other J owners acknowledge me on the road. There is a distinct and enviable camaraderie which exists between us which is not to be understated. I shall certainly consider the new model depending on final price but my wife is more than reluctant to part with our friendly J of 6 years plus, despite the obvious benefits of owning a similar vehicle with some notable technological advantages and, of course, improved fuel consumption. Understand the auto is about £20k and that that there is a 12 months wait.